Young Women on the Move (YWM) is a powerful TDSB mentorship initiative for girls in Grades 3-12. 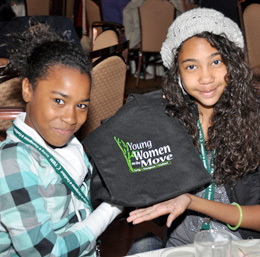 Building on existing mentorship programs for girls, YWM empowers girls to become agents of positive change. YWM is a growing network of socially conscious young women supported by meaningful relationships with a strong community of mentors. …They are more successful in school. Young Women on the Move (YWM) will empower girls to be agents of change utilizing confidence and courage to create a caring and positive world. Contact us at YWM@tdsb.on.ca if you require additional information.